Until 1950, Tibet was a Sovereign State of three provinces of U Tsang, Amdo and Kham, inhabited by six million people with a distinct language, culture and history dating back thousands of years. In 1950 Tibet was invaded by the army of her neighbour, The People’s Republic of China. 1.2 million Tibetans died as a direct result of Chinese occupation of Tibet. Over Six Thousand Monasteries, Temples and Historical Structures looted and destroyed. Tibet’s ecosystem has been severely damaged: vast tracts of forest have been denuded, wildlife species decimated. 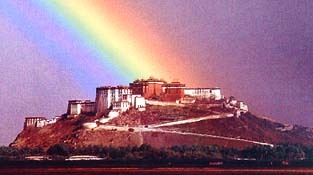 Tibet’s substantial mineral resources have been plundered. One quarter of China’s nuclear missiles are stationed in Tibet. China is using Tibet as a dumping ground for nuclear waste. Some three hundred thousand Chinese troops are based in Tibet. 7.5 million Chinese colonialists have been shifted into Tibet in a move to dominate the Tibetans. Forced abortions, many in late pregnancy, and sterilisation of Tibetan women is common. Some 4,000 Tibetan political prisoners are being held. In 1959 the International Commission of Jurists found that Genocide had been committed in Tibet. It’s just $30 per year to join FRIENDS OF TIBET. Keep yourself informed of the current event in New Zealand and Internationally relating to the Tibetan cause. You will receive a bi-monthly newsletter. China has re-drawn Tibet’s boundaries so that which China refers to as the Tibet Autonomous Region, now appears to be less than half its original size and has rewritten Tibet’s history book to justify its claim to Tibetan territory. The UN General Assembly passed three resolutions in 1960, 1961 and 1965, condemning China for violations of Fundamental Human Right of the Tibetan people and called on China to respect the Tibetan peoples’ rights including their rights to self-determination. His Holiness the Dalai Lama, the leader of the Tibetan people, has made a number of overtures to the Chinese Government, including the Five Point Peace Plan in 1987 and Strasbourg Proposal a year later, but has been met with silence from China. The resolution further stated that Tibet’s true representative are the Dalai Lama and the Tibetan Government in Exile as recognised by the Tibetan People. The Tibetan peoples’ struggle has been non-violent for fifty years and their courage in the face of sustained persecution and world-wide apathy truely deserves the support of those with the freedom to do so. Join FRIENDS OF TIBET and keep yourself informed of the current event in New Zealand and Internationally relating to the Tibetan cause. You will receive a bi-monthly newsletter. Purchase Free Tibet merchandise from our sales page. Become a sponsor of a Tibetan refugee child in India through Friends of Tibet (NZ) who will connect you with the Tibetan Children Relief Society, which was set up in early 1962 for purpose of helping Tibetan refugee children’s education. Write to your local MP asking him or her to join the Parliamentary Friendship Group for Tibet and take an active interest in the issue of Tibet.